Restorative justice is increasingly being applied to settings characterized by large-scale violence and human rights abuses. While many embrace this development as an important step in attempts to transform protracted conflict, there are a number of conceptual challenges in transporting restorative justice from a democratic setting to one which has been affected by mass victimisation or civil war. These include responding to the seriousness and scale of harms that have been caused, the blurred boundaries between victims and offenders, and the difficulties associated with holding someone to account and compelling reparative activities. Despite reams of paper being devoted to defining restorative justice within democratic settings (where the concept first emerged), restorative scholars have been slow to comment on the integration of restorative justice into the transitional justice discourse. 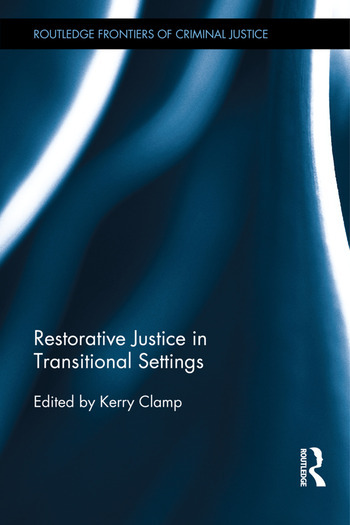 Restorative Justice in Transitional Settings　brings together a number of leading scholars from around the world to respond to this gap by developing and further articulating restorative justice for transitional settings. These scholars push the boundaries of restorative justice to seek more effective approaches to addressing the causes and consequences of conflict and oppression in these diverse contexts. Each chapter highlights a limitation with current conceptions of restorative justice in the transitional justice literature and then suggests a way in which the limitation might be overcome. This book has strong interdisciplinary value and will be of interest to criminologists, legal scholars, and those engaged with international relations and peace treaties. Kerry Clamp is a Senior Lecturer in Criminology in the Department of Social Sciences and Psychology at the University of Western Sydney. She received her Ph.D. from the University of Leeds in 2010 and also holds degrees from the University of Sheffield and the University of South Africa. Her research agenda focuses on the intersections of restorative justice and transitional justice, and of restorative justice and policing.